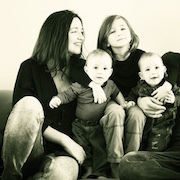 I a DONA Certified Birth Doula, Hypnobirthing Practitioner and Mother of three boys (including twins). I was drawn to the wonder of natural birth during my first pregnancy, when after extensive research, I chose to give birth at home. I have been active as a doula since my twin pregnancy when I experienced that a high-risk hospital birth can be equally empowering with a supportive team. I have had the honor of attending a diversity of births (unmedicated and medicated vaginal births, twin births, first time mothers, epidurals, VBACs) in homes, hospitals, and birth centers. Please email info@hypnobirthingny.com to check on Adrienne's availability for your birth. Having worked with many Hypnobirthing couples, I have witnessed, time and time again, how this technique helps the expecting couple approach labor and birth with confidence and ecstatic awareness. The result...a positive, peaceful, gentle and beautiful birthing experience for mom, partner and baby. My name is Alicia and I would be delighted to support you in the amazing journey of childbirth. My work is greatly influenced by my studies in Body-Mind Centering, as well as my background in anatomy, kinesiology, physiology, and embryology education. I am a DONA certified birth doula, a certified Breastfeeding Counselor, and a DONA trained postpartum doula. I have years of experience as a yoga therapist, specializing in prenatal and postpartum yoga, and am skilled in the use of breathing, acupressure, massage and Rebozo techniques for labor and delivery. I have worked with women giving birth at home, birth centers, and hospitals all around the NYC area. I have supported a wide variety of birth experiences, including unmedicated, medicated, high-risk pregnancies, VBAC (vaginal birth after cesarean), HBAC (home birth after cesarean), breech presentation, and C-sections. I am fully bilingual and at ease communicating in both English and Spanish. Please email info@hypnobirthingny.com to check on Alicia's availability for your birth. Hi! I am a NYC based certified labor doula, postpartum doula, breastfeeding counselor, placenta encapsulator and HypnoBirthing teacher. I also have a Masters degree in Infancy and Family Development. Being in the presence of birth feels so natural and right. I am deeply called to serve women and their partners in this capacity. It is my core belief that all women deserve to have a joyful and empowering birth experience. As your birth doula, I will support you in achieving your unique pregnancy and birth goals. In labor, I will help you stay calm and relaxed through discomfort relieving techniques such as varying positions, breath work, the Rebozo technique, massage, aromatherapy and of course all the HypnoBirthing tools! I am proud to assist women in releasing their fears and using hypnosis and deep relaxation in order to have a blissful and transformative birth experience. My primary intention is to stay tuned into your emotional state throughout the process and trust your internal wisdom as a birthing woman and new mother. In addition to my doula work, I am also a certified Fertile Body Therapist and enjoy assisting couples in achieving their fertility goals with hypnosis and mind body therapies. I am also a children's yoga teacher and certified scuba diver. Please email info@hypnobirthingny.com to check on Bailey's availability for your birth.